Prescription discount cards let you compare prices across thousands of pharmacies and offer discounts on prescription drugs. See our picks for the best prescription discount cards. 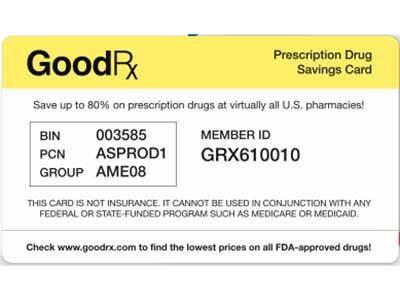 GoodRx offers multiple discounts with its prescription discount card including prescription coupons on a prescription-by-prescription basis. Get even deeper discounts for around $5.99 per month. 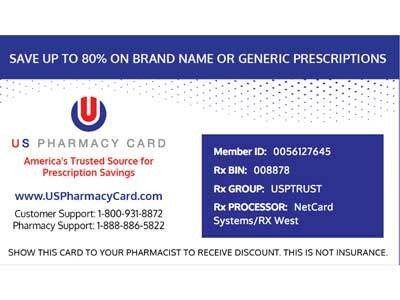 US Pharmacy Card is entirely card-based with no need to print coupons or provide personal information. Cardholder information is limited to card usage information and the company doesn’t share your information with outside sources. Discount Drug Network has a network of over 66,000 pharmacies in the United States. Use their mobile app to search for local pharmacies and discounted prescription prices. ScriptRelief has partnerships with several prescription discount cards and contracts with over 50,000 pharmacies. Its services are completely free. Use the ScriptRelief mobile app (SearchRX) to find participating pharmacies and discounts. In addition to discounted prescription drugs and a large pharmacy network, SingleCare has add-on programs for dental, vision, and video medical consultation discounts. SingleCare has the best card for extended discounts. One in four people have difficulty affording the cost of medication, and nearly 10 percent of all health care spending in the U.S. in 2016 was for prescription drugs. If you’re planning for retirement or simply sticking to a budget, prescription discount cards allow consumers to save money on medications at the pharmacy for a small annual or monthly fee. Some programs are offered at no cost. We evaluated multiple prescription discount cards and chose our top picks for individuals looking to reduce their prescription costs. We looked into a variety of factors including discounts, network availability, ease of use, privacy concerns, and program costs when making this evaluation. Our top five prescription discount cards are US Pharmacy Card, Single Care, GoodRx, ScriptRelief, and Discount Drug Network. In this guide, you will find prescription drug discount plan shopping tips, answers to frequently asked questions about prescription discount cards, and detailed reviews of each of our top company choices. Understand the ways prescription discount cards differ from insurance. Your introduction to a prescription discount card may have been when it showed up in your mailbox. Heavily marketed via the U.S. Postal Service, these discount cards resemble health insurance cards, but they are not the same as health insurance. Health insurance has you pay a premium and then pay a copay when you go get a prescription filled. If you are employed by a larger company, you may have a separate prescription drug plan that works with your insurance plan. A prescription discount card is a private discount program offered for a small annual or monthly fee. Some prescription discount cards are completely free. 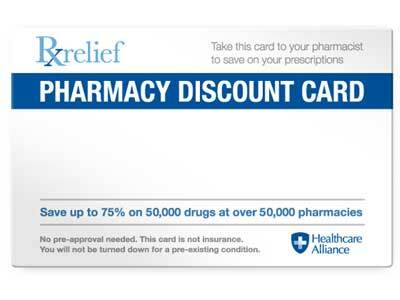 You can use these cards (or coupons) at any pharmacy within the prescription discount card company’s pharmacy network. Pharmacies, groups like AARP and insurance companies issue prescription discount cards you can apply for online. Although it’s less common, some medical insurance policies offer a prescription discount card instead of covering medication under a policy. Pharmacies that accept prescription discount cards do so based on a contractual agreement to offer reduced costs to cardholders. Pharmacies participate in these programs for a variety of reasons that increase sales. A variety of groups issue prescription discount cards, so no two programs are entirely alike, and some programs will work better for you than others. For example, one plan may offer the best prices at Walmart Pharmacy while another gets better discounts at Target or your neighborhood pharmacy. Also, discounts can vary by area and prescription. If there are more seniors in an area, discounts for medications used by that demographic will typically be more readily available. Many programs provide price estimates online so consumers can easily compare the cost of their medicines with each plan. Reading the instructions to learn how a prescription discount card works may seem like an overly-simplified tip, but it’s one you don’t want to skip. Carefully reading and following the directions for each discount plan is vital to save the most money. Some programs require you to print a coupon for each prescription to be used at a specific pharmacy for a limited time. Others require you to receive pharmaceuticals in the mail to get the full discounted rates in addition to a card to use at pharmacies. There is a network of pharmacies that accept a discount card, and you need to know how to determine which pharmacies are in your card’s network. With a prescription discount card, savings on generic drugs are usually much higher than savings on name brand drugs. Most doctors write prescriptions so you can choose to fill them with a generic equivalent when available. Be sure to check the generic pricing for your medications to compare savings. Prescription price search without personal information, printed coupons or digital coupons in the mobile app. Access multiple prescription discount programs in one place to find the best deals. Includes discounts on dental, vision and limited medical. Easily use HSA card for payment. No printing coupons, use a card. Covers pet medications filled at network pharmacies. Includes generics in prescription price search results to compare all savings. 1. We searched a comprehensive list of prescription drug discount cards. 2. We evaluated those prescription discount card programs based on our expert-guided buying criteria that included discounts, the size of the network, ease of use, and privacy. 3. We provided you with our best choices for prescription discount cards for you to consider. There are a large number of prescription drug discount cards on the market today. 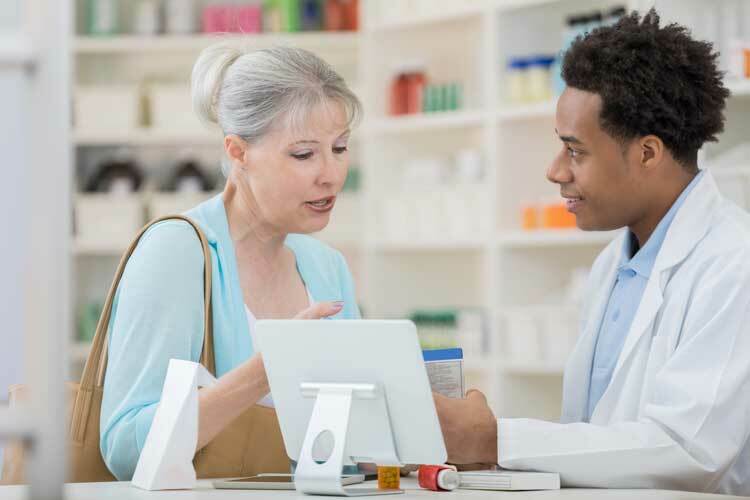 While many of them use a shared pharmacy network and discount plan, there are still differences in customer service, privacy, and how you can use the cards. Finally, we covered the most-asked questions about these discount cards and explained what you can do if a pharmacy refuses to honor a discount. After a careful review of our findings, we made our selections for the top five pharmacy discount cards: GoodRx, US Pharmacy Card, ScriptRelief, Discount Drug Network and Single Care. Each of these discount cards stood out from the pack in different ways. Our spot checks of a variety of drugs showed GoodRx had lower prices the majority of the time. Easy-to-understand language and zero personal information required to use the program. Over 66,000 pharmacies – most of all the discount card programs on our list. Optional programs for dental, vision, and video medical consultation discounts. Multiple discount cards offered under one umbrella. GoodRx is based in Santa Monica, California. The company maintains an “A+” rating with the Better Business Bureau after six years of operation and has had only five complaints in the last three years. GoodRx addressed the complaints to resolve problems with pharmacies refusing to honor the prescription discount card. A vast network of pharmacies accept GoodRx across the country and take the card in the form of coupons generated on a prescription-by-prescription basis. The cost is free to the consumer. In addition to pharmacy discounts, GoodRx offers medication price search tools on their website and mobile app. Without logging in, you can search to find to best discounts on prescriptions in your area, then either print a coupon or use the app to show the pharmacy a digital coupon on your mobile phone. GoodRx Gold is an optional program offering deeper discounts for a monthly fee of $5.99 for an individual or $9.99 a month for families (up to five individuals). GoodRx also offers discounted pet medications at participating providers, including online retailers. You are not required to sign up for the Gold program and the original prescription discount care is free. Based in New York, ScriptRelief has been in business for six years and holds an “A+” rating with the Better Business Bureau. In the last three years, there have been 5 complaints, primarily due to consumers receiving the card in the mail when they didn’t order one. ScriptRelief answered each person individually to assist them or explained that the card received was through an agreement with OptumRx, a part of United Healthcare. ScriptRelief has partnerships with several prescription discount cards and contracts with over 50,000 pharmacies. There is no cost to use the program. ScriptRelief works through partnerships with several cards, including National Prescription Savings Network, Internet Drug Coupons, and Discounted Prescriptions Network. SearchRx is the company’s brand and mobile app. National Prescription Savings Network (NPSN) sends cards to consumers and works when you show your prescription discount card to the cashier at the pharmacy to verify the savings. There is no need to sign up or even login to use the program. InternetDrugCoupons works on a discount card system as well, with no need for a personalized card. Discounted Prescription Networks (HelpRx.info on the web) also works on a coupon basis. Enter your name and email address online or in the app to get a coupon. Discounted Prescription Networks reveals no prescription drug prices, only the discount percentage that may be available. Coupons can be accessed online or via their mobile app. SearchRx works on a coupon system. Using either the website or mobile app, search for prescriptions by ZIP code and then print a coupon for use at a network pharmacy in your area. SearchRx: Minimal data collection mainly centers around 3rd party ads on the internet. SingleCare offers prescription discount cards as well as discounts on other healthcare services. The company is based in Columbus, Ohio and has been in business for three years. They hold an A+ Better Business Bureau rating with only five complaints from consumers who felt the program was too complicated when used for more than prescription savings. SingleCare’s pharmacy network extends to over 35,000 pharmacies and providers. There is no fee for using SingleCare. 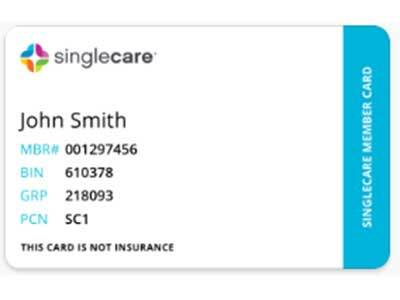 The SingleCare card offers basic discounts. To get higher discounts on your prescriptions, up to 80 percent off, you must use the website or mobile app to print coupons for use at a selected pharmacy. Pharmacies like Walmart and CVS use multiple pricing tiers at different levels of the program, which requires SingleCare customers to provide some personal data for full access to advertised discounts. To take advantage of discounts on dental, vision, on-demand video consultations with a doctor, and some office visits, enroll in SingleCare’s free membership. The only requirement to take advantage of these discounts is that you need to store credit card information with SingleCare, which bills the card with the discounted price after you receive care. You can also enter a Health Savings Account card. Your credit card information is required even if you only intend to use the pharmacy discount card. SingleCare offers a $25 incentive reward for each person you refer to the program. The reward amount shows up as a credit on your SingleCare account, to be used to pay for future charges. Founded in 2016, Discount Drug Network is based in Philadelphia, Pennsylvania and is part of Health eCommerce LLC. The parent company has an “A” rating with the Better Business Bureau with only one customer complaint in the last three years. The pharmacy network includes over 66,000 in the U.S and offers up to 85 percent off of medications. 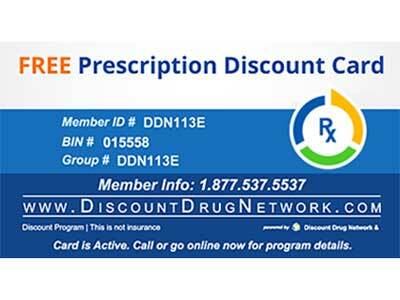 The Discount Drug Network program works as a card or with coupons. Your care and coupons are printed, texted, or emailed from the website or mobile app. The Discount Drug Network mobile app is used for searching for local pharmacies and for pricing prescriptions; to use the program, you must print a card from the app to show the pharmacist. Prescription searches include generics in case that option costs less than their discounted price. This prescription discount program offers the Pet Rx card with savings on veterinary prescriptions filled at participating pharmacies. US Pharmacy Card is based in Ponte Vedra Beach, Florida as part of the Financial Marketing Concepts family of companies. Financial Marketing Concepts has an “A+” rating with the Better Business Bureau with no customer complaints. The US Pharmacy Card program has been in existence since 2005, working via pharmacy partnerships. The US Pharmacy Card program is entirely card-based with no need to print coupons or provide personal information. Their network currently includes over 59,000 pharmacies. The card can also be used with pet prescriptions filled at a network pharmacy. Using this discount prescription program is very straight-forward, with an online pharmacy search and price listings to make shopping for discounted prescriptions easier. We did not find a mobile app for US Pharmacy Card. Are prescription discount cards the same as insurance? While they offer discounts on prescriptions, these cards are not insurance. A prescription discount card does not fulfill the minimum insurance requirements of the Affordable Care Act, so treat it separately from medical insurance. Do HIPAA privacy rules cover prescription discount cards? The HIPAA privacy rules only apply to health care providers, health insurance plans, and health information clearinghouses that maintain records or submit claims for other covered entities. Since none of those entities administer prescription discount cards, there is no privacy protection under HIPAA. Like your grocery store loyalty card, prescription discount card data can be shared or sold to marketing firms and other companies. However, pharmacies are covered by HIPAA and do not disclose personally identifiable information to the discount card company when you fill a prescription. Are there any restrictions on using prescription discount cards? The vast majority of health insurance companies will not process drug claims if you use a prescription discount card. These cards are used instead of insurance with a cash purchase. You can’t use the discount on some medications if you have Medicare, even if you wish to pay directly instead of filing a claim. If you use the discount card instead of your health insurance, the purchase will not count toward annual out of pocket cost or deductible calculations. Where can I use the discount card? Prescription discount cards only work at pharmacies that have agreements with the card company. Your discount card will provide you with a network list of pharmacies that accept the card, or you can search for approved pharmacies on the card website. Who pays for the discount card? While some prescription discount cards charge a membership fee, most are free to the consumer. The card companies may charge network pharmacies transaction fees or sell marketing data collected from users. Yes, you can use multiple discount cards to compare which has the best prices for your prescriptions. For example, Tamiflu under one program is $52 and $162 under another. What happens if my pharmacist won’t take the card? Mistakes can happen and while rare, pharmacy chains sometimes don’t update all databases with the latest participating discount networks. If you use your prescription discount card mobile app, you can show your pharmacist the network list. Alternatively, you may be able to print the list from the card website to keep with you when you go to the pharmacy. The pharmacist can enter your card or coupon into their system, and it will show the medication price based on the discount contract. If a pharmacist refuses to run your prescription discount card, you can call the number on the card to let a representative talk to the pharmacist directly. If the representative doesn’t resolve the problem, you will need to have your prescription filled at a different location. Consumers are expected to spend over $338 billion on prescriptions in 2019, so it’s worth taking a look at prescription discount cards to save money on your medications. Our list of the best prescription discount cards gives you plenty of options for saving money on medications at the pharmacy. With such a variety of free prescription discount cards to choose from, you can use our recommendations to quickly find the prescription discount program that works best for you based on drug prices and pharmacy locations.